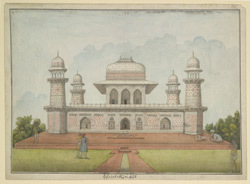 Watercolour by an anonymous artist of the Mausoleum of I'timad al-Daula at Agra in Uttar Pradesh with a number of figures in the foreground, dated between 1820 and 1825. The image is inscribed on the front in Persian characters: 'Naqshah i maqbarah i Nauwub I'timad al-Daulah dar Akbarabad' (Picture of the tomb of Nawab I'timad al-Daula in Akbarabad); and on the back in English: '15. The Tomb of Aitma dowlah Agra'. I'timad al-Daula (Emperor's Pillar) was the title bestowed upon Mirza Ghiyas Beg by Emperor Jehangir. Of Persian descent, Mirza Ghiyas Beg became the first treasurer and then the prime minister (wazir) under Emperor Jehangir. His daughter, Nur Jahan, later married the Emperor and commissioned the mausoleum to honour the memory of her father upon his death in 1622. The exterior of I'timad al-Daula is faced entirely in white marble. It was the first Mughal structure to be completely encased in marble and extensively use pietra dura, the marble inlay work that is associated with the Taj Mahal. The tomb is of a modest scale, built on a low platform 1.22 metres high. It has a square plan subdivided into nine chambers, with four corner octagonal towers in the form of minarets. The minarets frame the central roof pavilion that marks the central tomb chamber below. The kiosks of the minarets consist of small hemispherical copulas resting on arches supported by eight pilasters. The roof pavilion imparts a distinct Hindu feel in its use of Bengali roof with wide overhangs or eaves (chhajja). The mausoleum is set within a garden surrounded by walls forming a perimeter of 165 metres on each side. The approach is from the east through a red sandstone gateway that is decorated with rich marble mosaics. Sandstone pathways lead up to the main tomb. Each of the façade has a central arched entrance, flanked by two recessed arches that are closed by beautiful marble screens (jali). Fine corbels support the cornice, which has a marble tracery (jali) balustrade running along the length of it. The platform and tomb is embellished with mosaics and inlay work of coloured marbles. The interior is a series of rooms and corridors arranged around a verandah that surrounds the central chamber containing the cenotaph. The square roof pavilion above the central chamber allows the light to filter down through its perforated marble screens (jalis) to wash over the two porphyry yellow cenotaphs of I'timad al-Daula and his wife. The interior boasts stucco and paintings in a variety of patterns with motifs inspired by motifs of Persian origin. Intricate stalactites have been done one the soffits of the corner chambers and the main hall. The surfaces above the dados have regular distributed niches, alcoves and decorative panels that allow for variations in decoration to take place.